As the college archivist, Diane Ziliotto collects and organizes historical documents and artifacts. 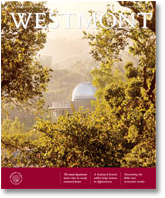 She studies Westmont history and seeks to know as much as she can about the college and the campus throughout the years. She’s always been interested in the Dwight Murphy property and the original estate built on the site in 1907. Peter and Jennie Murphy, Dwight’s parents, named this grand home Graystone Terrace and later El Tejado. 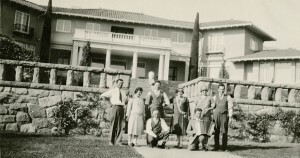 The Santa Barbara Historical Society and the Montecito Association possess only one photograph of the building, and Diane has never been able to locate others. Then in May, she discovered images of El Tejado in an unexpected location: her grandmother’s photo album. The third generation of her family to live in Santa Barbara, Diane has inherited memorabilia from her relatives. Angelo Mario Perocco, Diane’s grandfather, arrived in Santa Barbara in 1920 from Crespano del Grappa, a small town in northern Italy. He fought for the Italians during World War I and sought to escape the poverty and chaos that followed. He became a partner in the Universal Bakery and Store on Olive Street (later split into two businesses). He returned to Italy to marry Marianna Tonella, Diane’s grandmother, and their first child was born in 1928. 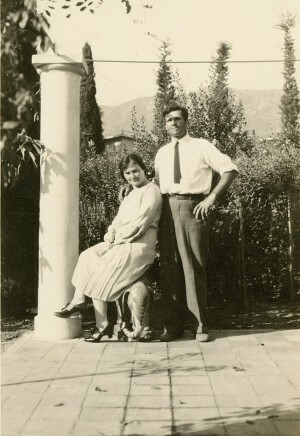 Angelo and Marianna belonged to the sizable northern Italian immigrant community in Santa Barbara. Many of these men and women worked on Montecito estates as gardeners and housekeepers. 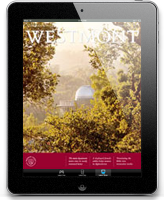 Some built the stone walls that adorn many properties, including Westmont’s. The tight-knit Italian group occasionally gathered for picnics on the estates where they worked—when the owners left town. They dressed up, brought their families and enjoyed the scenery of the lovely grounds. Photographs commemorated these festive outings. The Peroccos never worked on the Murphy estate, but they must have known people who did. Diane discovered a series of photos taken in what is now Westmont’s formal gardens with the house visible in the background. As Marianna holds an infant, Diane dates the photo to 1928, just before Jennie Murphy Baldwin demolished El Tejado to make way for the new home (now Kerrwood Hall) designed by Reginald Johnson and built in 1929. The one known photo of the original estate likely dates from an earlier period as it depicts a different colonnade on the exterior facing the gardens. One of Diane’s photos reveals two of the columns that still stand in the formal gardens, and another shows the brickwork and column outside Voskuyl Prayer Chapel. The wall in the photo has a balustrade, and Diane has uncovered stones on campus that clearly show the removal of this decorative feature. She has also located the distinctive, rectangular stone set at an angle visible in the photo and easily discernible today. She still has trouble believing she discovered such Westmont treasures in her own home.